I am a frequent side sleeper so the plushness of the pillow top gives me the softness and support I need. I have this on an adjustable platform and it conforms well to the different positions. When I sleep on my back, it gives me good support. I have had this mattress about a month. So far, I am very happy with it. 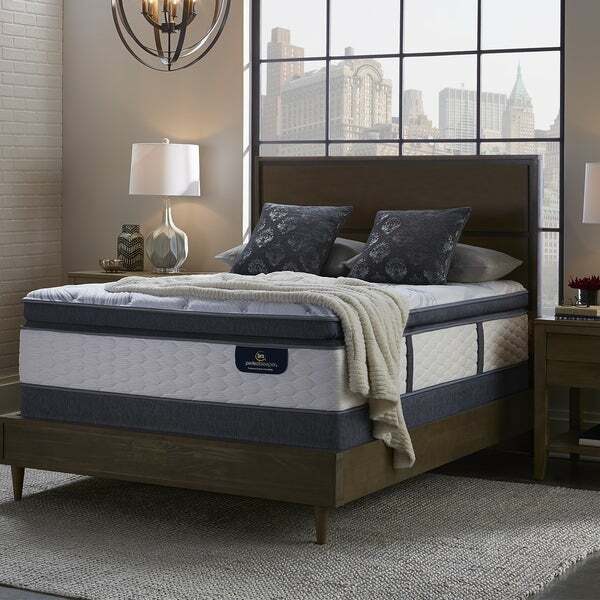 This mattress also features Serta's Comfort XD Foam and Serta's new Balanced Support Foam for that 'just right'28 inches combination of cushioning comfort and enhanced support. White glove delivery. Great price with coupon. Very comfortable soft but very supportive, will post further review after sleeping on it for a while. Love this mattress. It is comfortable for both of us and we usually prefer different levels of softness/firmness and the pillow top gives us both. We were long overdue for a new mattess. I am a soft sided waterbed woman. I am amazed at how comfortable t his mattress is. I have had some of the best nights sleep for a very long time, not only that but the price was incredible. Enjoy! This mattress is Wonderful! It's firm but is still soft due to amazing pillow top. I'm very happy with my purchase! The mattress is extremely comfortable!!!! We both love it! After finding this bed and seeing the price, we thought we'd give it a shot. It took so long to even be notified of delivery after I placed the order, and then another week for it to come. When it finally arrived the delivery guys told me it had a huge tear in it. So I refused delivery and ended up purchasing something from a local store the next day. I will say that Overstock made returning easy and fast. If only getting in here in one piece could have been that fast. Firm but soft in all the right places! we love our mattress! For it being a “plush” pillow top it isn’t very soft. I’m a side sleeper and the first nine night I woke up so sore the next morning. My body seems to be getting use to it, not as comfy for side sleepers but comfy if you sleep on your back. It advertised the parameters I was looking for in a mattress. "What is the firmness level of the mattress?" "Will I need to purchase a box spring with this or is this all I need?"